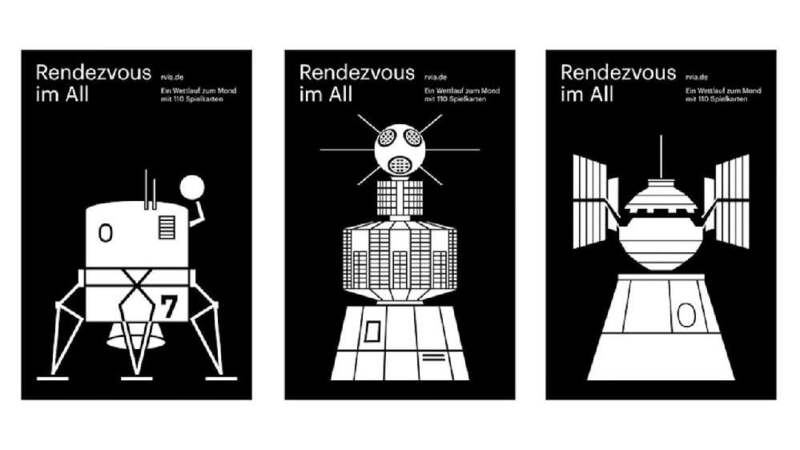 The three motifs of the poster series “Rendezvous im All” (Rendezvous in Space) were conceived to promote the card game of the same name comprising 110 individual cards. By placing the cards together, they form a space rocket that resembles one of the three poster motifs. Accordingly, as the three black-and-white motifs illustrate, the top part can turn into a space capsule, a satellite or a space probe. The game is about the race to the moon, building and launching rockets fictitiously, communicating by radio signals and directing aviation manoeuvres. The highest score and the actual “rendezvous in space” is achieved when a player manages to launch two space capsules and plays this particular eponymous card. Featuring minimal flat illustrations, the posters try to capture the spirit of the Apollo missions of the 1960s and 1970s. In a highly abstracted manner, they convey something technically playful and humane at the same time, and creatively reproduce the fascination surrounding space and technological progress. These promotional posters inspire through the simplicity of their illustrations and meet the requirements of a good poster in being bold, easy to understand, beautiful and perfect. The three different vehicles of the astronauts feature individual and expressive appearances. The typography and colour choice are also consistent, lending the poster series a well-balanced look, including a wink of the eye.